The Illinois Department of Natural Resources is celebrating the fact 30 properties in the state were added to the National Register of Historic Places during 2018. One of those sites is the First National Bank Building – now known as Collins Tower – in downtown Danville. It was previously known as Bresee Tower. 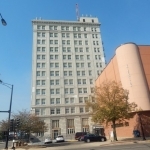 The 12-story building was added to the National Registry of Historic Places on September 13, 2018. The listing says the building is an excellent local example of the Classical Revival style. It was built in 1918 and was added to the National Registry on September 13, 2018. In November Jeri Collins, one of the new owners of the building, outlined new plans for the building. She said the first floor would have a restaurant, and there would be living space on the other floors. Collins said there would be two apartments per floor. And she added the top floor is where the owners plan to live. It is estimated that it will cost between seven and nine-million dollars to complete the renovation of Collins Tower and the former courthouse annex buildings. In addition to the building in downtown Danville, some other Illinois sites added to the National Registry of Historic Sites last year include Bloomington High School and the Downtown Peoria Historic District, among others. Places are added to the register by the National Park Service based on recommendations from the State Historic Preservation Office, a division of IDNR. The entry about the First National Bank Building in Danville notes it is clad completely with terra-cotta on its two primary facades – and that the building towers over Danville’s skyline.